Maybe I set too high a bar for former Lt. Gov. Patty Judge’s initiative to engage rural Iowa voters. The first news release from the organization, Focus on Rural America, arrived Tuesday afternoon. It contained a summary of the group’s revelations following a series of focus groups with rural Iowans who switched their presidential vote from Democrat Barack Obama in 2012 to Republican Donald Trump in 2016. None of the findings are earth shattering. • Both Obama and Trump were considered agents of change, candidates the broke the status quo. • Messaging by the Hillary Clinton campaign was described as murky; the Trump campaign messaging was clear. • Democrats generally were perceived as focusing too heavily on entitlements and social programs, which voters translated into a lack of interest for the plight of average Americans. • Neither party is believed to be adequately addressing rural needs. • At the state level, voters continue to weigh 2018 gubernatorial options, and many are unhappy with economic initiatives undertaken by the GOP-controlled legislature this year. Except for the state government questions, this has all been well documented. More important is what should and can be done with this information. There is now a segment of our country that believes it is not getting a fair shake, that has, for nearly a decade, voted out of desperation more often than confidence — for good reason. As reporters Janet Adamy and Paul Overberg laid out in shocking detail for the Wall Street Journal this week, rural areas are failing and increasingly becoming worse in key measures of socioeconomic well-being — a status just three decades ago that was assigned to inner cities. “In terms of poverty, college attainment, teenage births, divorce, death rates from heart disease and cancer, reliance on federal disability insurance and male labor-force participation,” the story said, “rural counties now rank the worst among the four major U.S. population groupings” — the others being big cities, suburbs and medium or small metro areas. A host of factors have contributed to this accelerated decline — plenty of blame outside the sphere of politics, and plenty more tucked within Republican and Democratic policies. President Theodore Roosevelt stood before Congress in 1903 to discuss “the unwholesome tendency” of people to trade rural life for city dwelling. Every White House administration since has launched some sort of rural revitalization plan to entice young adults to put down roots, spark a new generation of family farmers or promote business growth. Iowa government officials have taken their best shots, too. Yet it’s been hit-and-miss relief. 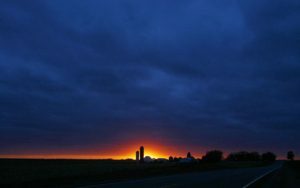 Is rural Iowa still a place worth saving or a place no longer deserving of salvation? And either way, doesn’t patriotic loyalty and commitment include some level of government responsibility for those who live there? Such questions — more easily posed than answered — are the crux of my high expectations for Judge’s initiative. I hoped the organization would try. “The goal of Focus on Rural America is to investigate this shift, engage rural communities in a discussion about the issues that motivate them and develop a positive progressive message that will resonate in rural America,” Focus on Rural America adviser Sam Roecker said. Rural Iowa, just like the rest of rural America, needs many things. It could use more health clinics, physicians and lawyers. It’s food deserts could be eased by better access to nutritious and affordable groceries. Rural school districts would benefit from more equitable funding, and towns could be revived by expanded tax bases. Just as in 1903, most places would benefit from an influx of young residents. Recent headlines paint an accurate and grim picture of what happens when politicians’ appeals to rural voters are drafted with an eye toward the next round of election-night returns. Changes in immigration policies leave small communities with even fewer physicians, which may not matter as thousands of rural Iowa residents may be forced off health insurance. Funding earmarked for the clean up of abandoned rural industrial sites is slashed. Decades-old national service initiatives providing learning opportunities for younger rural residents and valuable services to rural communities are considered expendable. Billions in farm safety-net programming is placed on the chopping block. Billions more intended to support rural businesses and entrepreneurs or fight persistent poverty could be cast aside. And deeper cuts to public broadcasting leaves rural residents ill-equipped to combat a constant barrage of slanted commentary intended to inflame rather than inform. Instead of more dead-end autopsies of 2016, let’s focus our microscopes on the unwillingness of political parties to translate successful campaign rhetoric into policy that benefits rural communities. Maybe then we’ll know what rural voter message will finally resonate in Washington and Des Moines. Clearly their past missives have fallen on deaf elephant and donkey ears.